JF. Barber was a Midwestern tattooist who worked in Cincinnati Ohio and Detroit Michigan beginning in the 1910s. Barber often billed himself as "Professor". 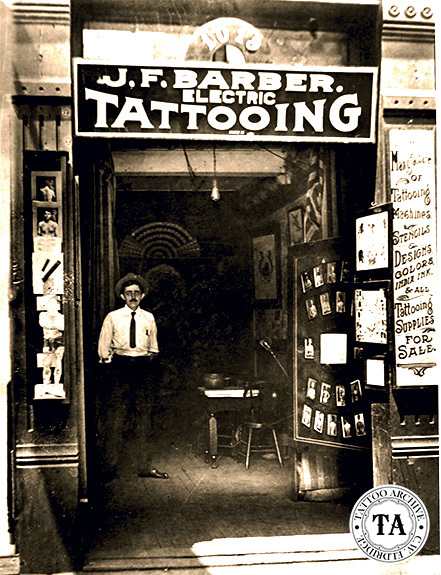 In addition to tattooing he also operated a supply business, manufacturing and selling tattoo supplies. He sold several different machines and the parts to maintain them. Some of Barber's machines are smaller than normal size and he stamped his name on the uprights of most of his machines, so they are easy to identify. Most suppliers of that era advertised in Billboard Magazine and Barber was no exception. An April 1912 ad in Billboard listed Prof. Barber at #1019 Vine Street in Cincinnati, Ohio. 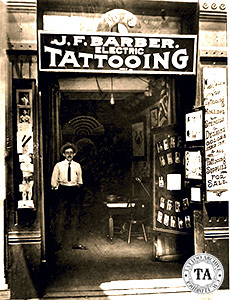 Barber also tattooed at #70 1/2 Brush Street in Detroit in the 1920s.